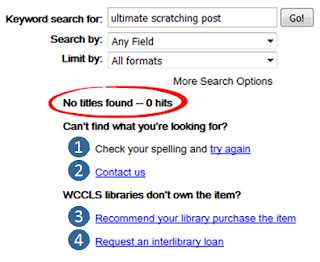 WCCLS: News & Events: Meet the (pretty awesome) Catalog: Zero search results? Meet the (pretty awesome) Catalog: Zero search results? 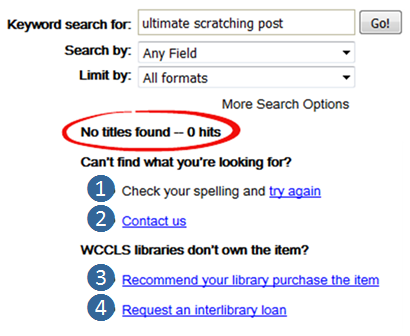 Trivia question: How many items are in the WCCLS catalog? Oh, go on and guess before you keep reading. For the record, say it out loud. Okay, ready for the answer? One point six five million items! Yes, that is a lot of options for you… 1,650,627 to be exact (as of today). However, we don’t have everything you could ever think of. And even with your stash of (pretty awesome) Catalog tips, there will still be times when your search terms find zero titles. Check your spelling. Spelling does matter in the PAC. If you’re not sure how to spell something (i.e. Sophia vs. Sofia), pop over to a new tab in your browser and Google it. Contact us. If you’re not sure what you’re looking for, call or email your library. You can also send your question via chat or text message. Recommend your library purchase the item. Your library likes to hear your suggestions! Request an interlibrary loan (ILL). If another library has it, we will try to get it for you… for free! Note: This is the eighth of eight weekly tips about our online catalog.